The mission of the Brotherhood of St. Moses the Black is to minister to Americans the gift of Orthodoxy. 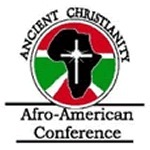 In an effort to be good stewards of the manifold grace of God (I Peter 4:10), the organization presents an annual conference that explores the African roots of Orthodoxy. Its vision is to bring Americans closer to Jesus Christ. The title of this particular conference is “The Ancient Faith for Modern Problems.” Ancient Faith Radio and the Brotherhood of St. Moses the Black are happy to provide these lectures for free download and distribution. Please share the talks with friends and family. Please note that in addition to the speakers below, Fr. Paisius Altschul, priest at St. Mary of Egypt Orthodox Church in Kansas City, Missouri, delivered a speech titled “FOCUS North America: The Ancient Faith’s Response to Modern Problems.” Unfortunately, due to technical difficulties, we were unable to record this particular talk. Fr. John Finely, mission priest with the Department of Missions and Evangelism of the Antiochian Orthodox Christian Archdiocese of North America. Fr. Moses Berry, one of the founders of the Brotherhood of St. Moses the Black and the current president. An impromptu choir led by Dr. Carla Thomas, Vice President of the Brotherhood of St. Moses the Black, sings three Orthodox hymns and then Subdeacon Paul Abernathy, a recent graduate of St. Tikhon's Orthodox Seminary, talks about his work with FOCUS North America. His Grace Bishop Matthias, the new Bishop of Chicago and the Midwest of the Orthodox Church in America. Fr. Jerome Sanderson, an iconographer and priest in the Bulgarian Orthodox Church. Mother Katherine (Weston), teacher of iconography and member of the St. Xenia Monastic Community in Indianapolis, under the Serbian Orthodox Church.